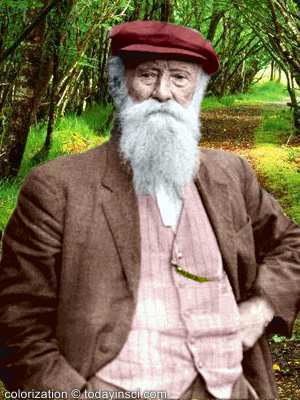 American naturalist and author whose many writings and books, by celebrating nature in highly readable essays, significantly nurtured the conservation movement in the United States. Joy in the universe, and keen curiosity about it all—that has been my religion. The Heart of Burroughs's Journals (1928), 257. One summer day, while I was walking along the country road on the farm where I was born, a section of the stone wall opposite me, and not more than three or four yards distant, suddenly fell down. Amid the general stillness and immobility about me the effect was quite startling. ... It was the sudden summing up of half a century or more of atomic changes in the material of the wall. A grain or two of sand yielded to the pressure of long years, and gravity did the rest. Under the Apple-Trees (1916), 105. Science is a capital or fund perpetually reinvested; it accumulates, rolls up, is carried forward by every new man. Every man of science has all the science before him to go upon, to set himself up in business with. What an enormous sum Darwin availed himself of and reinvested! Not so in literature; to every poet, to every artist, it is still the first day of creation, so far as the essentials of his task are concerned. Literature is not so much a fund to be reinvested as it is a crop to be ever new-grown. Indoor Studies, vol. 12, Collected Works, Houghton (1913). 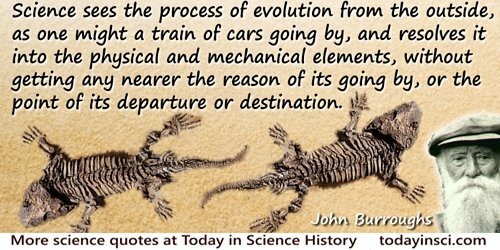 Science sees the process of evolution from the outside, as one might a train of cars going by, and resolves it into the physical and mechanical elements, without getting any nearer the reason of its going by, or the point of its departure or destination. From Under the Apple-Trees (1916), 212. The floating vapour is just as true an illustration of the law of gravity as the falling avalanche. The Century Illustrated Monthly Magazine, May 1883 to October 1883 (1883), 26, 539. 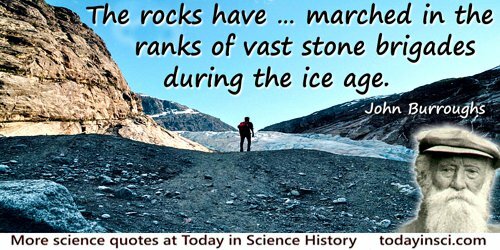 The rocks have a history; gray and weatherworn, they are veterans of many battles; they have most of them marched in the ranks of vast stone brigades during the ice age; they have been torn from the hills, recruited from the mountaintops, and marshaled on the plains and in the valleys; and now the elemental war is over, there they lie waging a gentle but incessant warfare with time and slowly, oh, so slowly, yielding to its attacks! In Under the Apple-Trees (1916), 42. To treat your facts with imagination is one thing, to imagine your facts is quite another. [Theodore Roosevelt] was a naturalist on the broadest grounds, uniting much technical knowledge with knowledge of the daily lives and habits of all forms of wild life. He probably knew tenfold more natural history than all the presidents who had preceded him, and, I think one is safe in saying, more human history also. In 'Theodore Roosevelt', Natural History (Jan 1919), 19, No.1, 5. Thinking, after a while, becomes the most pleasurable thing in the world. Give me a satchel and a fishing rod, and I could hie myself off and keep busy at thinking forever. I don't need anybody to amuse me. It is the same way with my friends John Burroughs, the naturalist, and Henry Ford, who is a natural-born mechanic. We can derive the most satisfying kind of joy from thinking and thinking and thinking. 3 Apr - short biography, births, deaths and events on date of Burroughs's birth. John Burroughs - Great Questions In Little: Astronomic Grandeur - an excerpt from Under the Apple-Trees (1916) - reflections on the Universe, the Why and How of science, the Limitations of Science, the Beginnings of Life, and Evolution. “A Prophet of the Soul” - John Burroughs on Henri Bergson’s philosophy. Theodore Roosevelt - naturalist - In Memoriam by John Burroughs in Natural History magazine (1913).